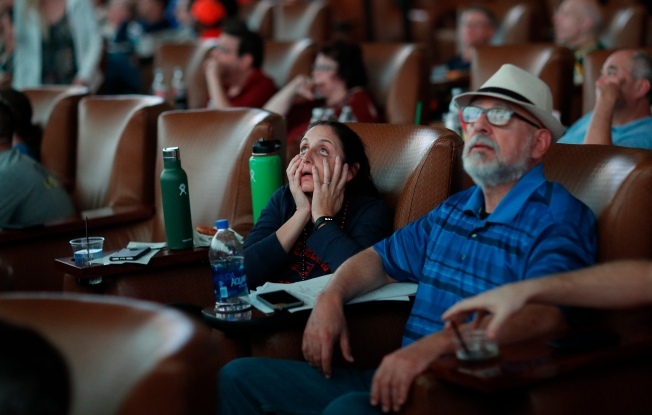 Lauren Greenberg, a New England Patriots fan, reacts while watching Super Bowl LIII at the Westgate Superbook sports book, Sunday, Feb. 3, 2019, in Las Vegas. 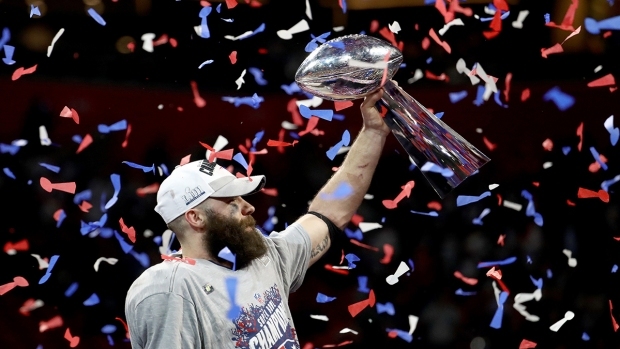 Football fans bet legally on the Super Bowl from states other than Nevada for the first time Sunday, with the excitement spreading from Las Vegas to as far as Rhode Island. Sunday's big game was the first major sporting event for sportsbooks in a handful of states that opened after the U.S. Supreme Court in May struck down a ban on sports betting. People lined up at sportsbooks starting Sunday morning, picking between the New England Patriots and Los Angeles Rams as well as a wide variety of other outcomes, from heads or tails in the opening coin toss to whether Tom Brady would throw an interception. "I love to bet, and I like the atmosphere here," Celina Montenegro, a resident of Austin, Texas, said while waiting for the game to start at the Westgate casino-hotel in Las Vegas. "They say this is the best place to watch the game other than being at the game." Residents took advantage of legalized sports betting at local casinos during the Super Bowl. Nevada's effective monopoly on sports betting ended last spring, when the Supreme Court struck down a federal ban on that form of gambling. Casinos in seven other states — Rhode Island, Delaware, Mississippi, New Jersey, Pennsylvania, West Virginia and New Mexico — now accept wagers on sports. The list is expected to grow by next year. In Rhode Island, the only state in the New England that has legalized sports betting, two casinos took plenty of wagers on the Patriots since posting the odds on their boards. 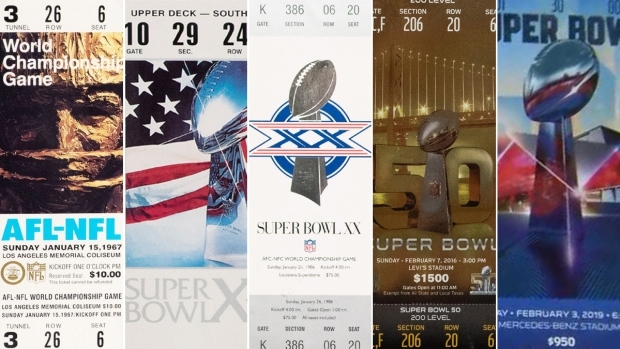 Several people placing bets in that state for the Super Bowl this week said they've wagered on sports in Las Vegas in the past. "It's nice and I'm definitely all for it, as far as tax revenue is concerned," Peckham, 27, said. "It's unique. I also think in future years, it'll give people more of a reason to watch the games." If he didn't have a place to bet on the Super Bowl close to home, Peckham said he may have bet on the outcome of the Super Bowl with his friends. He said he knows people who use bookies and betting websites but he does not. Joel Mallari, of Tustin, California, made arrangements for a trip to Las Vegas with a friend after the game was set. They chose to watch the game at the Linq's newly renovated sportsbook and put money on the Rams to win as well as on proposition and parlay bets. "We are here to make money and enjoy the game," Mallari said enthusiastically as he looked through a set of legal-size sheets with all the available wagers. "Betting makes things a little more exciting, even small figures," his friend, Eric Alvarez of Riverside, California, said. Associated Press writers Jennifer McDermott and Geoff Mulvihill contributed to this report.